I have long held the idealistic view that when something is sparked in young people, when talents and skills are given expression, there is an opportunity to thrive. We often hear the term “disaffected youth”. The term disaffection speaks of alienation or estrangement. As a result, I am drawn to stories where young (and old) people are engaged, connected and have a sense of belonging. This is why I found the documentary film If you build it so compelling. The Field of Dreams quote missed the mark, in my mind “if you build it they will come”. There is always so much to do for success, merely building something does not guarantee it. So the absence of the second half of the quote gives us the starting point, “If you build it”… maybe it gives the opportunity, should they choose. This feature-length film is set in Bertie County in North Carolina. Two designers, Emily Pilloton and Matthew Miller embark on a project in this sad and destitute area in America’s south.They see this more than a “project”, Emily and Matthew throw themselves into the life of the town, they live there and want to contribute. The set up Studio H – humanity, habitats, health and happiness – a design studio with a social conscience. The film follows the lows and highs of the journey. This includes the over-bureaucratic local school board withdrawing support for the project, but Emily and Matthew persevere. They are pretty tenacious. I loved how this pair engaged with the students, built their trust and presented achievable, yet still challenging design projects for the students. Across the 85 minutes we see the transformation from disaffected to connection, belonging and a sense of hope in their future. It left me with a lump in my throat. If you are in Sydney, see this film and discussion about the place of design as education. It is presented by the NSW Chapter of CEFPI – another intersection of design and education. Following the film, light refreshments will be provided, and an expert panel will discuss the themes of the film. Paul Pholeros a Director of Healthabitat, a company that for over 30 years has worked to improve the living environments of Indigenous people in many suburban, rural and remote areas of Australia and internationally. Matt Esterman History and e-learning coordinator at St Scholasticas College, Glebe. His current research looks at user voice in the design process for new learning spaces and school buildings. Matt is an actively engaged professional at TeachMeets, He regularly blogs and tweets @mesterman. Genevieve Blanchett a designer who operates across architecture, urban design and the performing arts with a focus on community-driven creative place making and arts-based development projects. 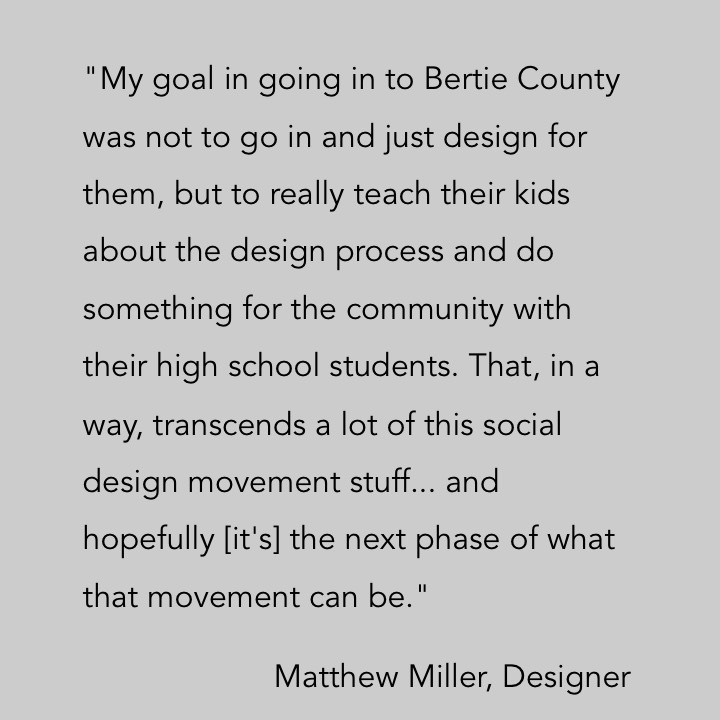 Interview with designer, Matthew Miller and Another article.